Kombucha Tea is a fermeneted tea with probiotics in it. It’s believed to have a number of health beneits related to it. This recipe and instructions were given to me by Rick from our local Whole Foods Market. 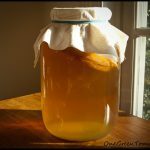 He’s recently had so many people come to him asking how he makes his Kombucha, that he was kind enough to type it up and keep copies at work for people – as well as giving me permission to reproce his instructions here on the site. At this point, make sure all utensils and containers used afterwards have been rinsed in strong Kombucha or vinegar. This protects against mold, and is especially important with your first batch. Add a half gallon of cold (filtered) water – helps cool the tea down. 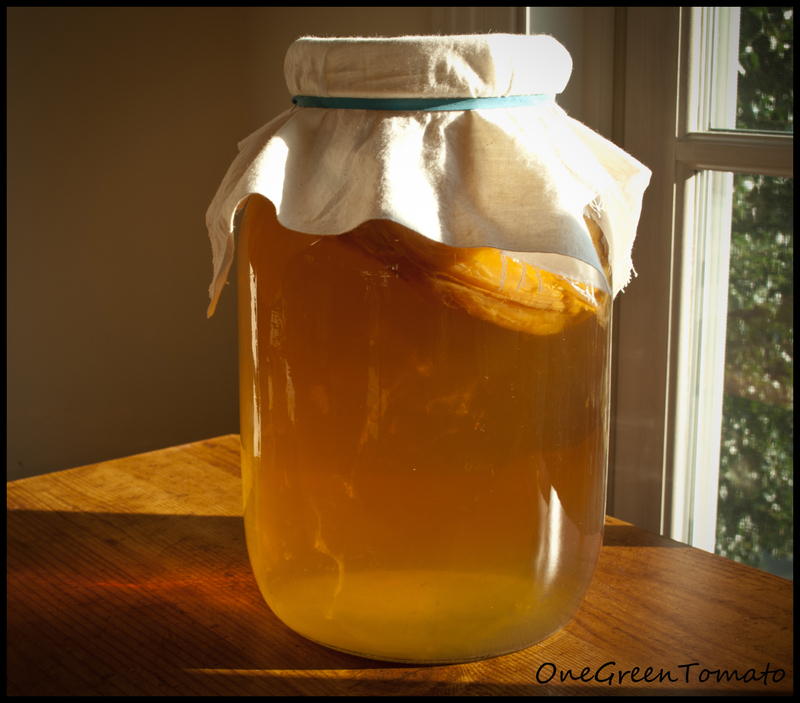 Once the tea has reached room temperature, add the SCOBY and starter tea. Set jar in the dark at room temperature. It’s finished when it tastes the way you want! We usually stop our first fermentation when there’s still a faint hint of sweetness left in the tea. The remaining small amount of sugar will be used to make cabonation during the second fermentation. Note: The second fermentation is optional. Some people drink their KT (Kombucha Tea) right after the first fermentation. Bottle the entire gallon of KT except for a cup or two for the next batch. We use crimp-top glass bottle with the metal caps. You can easily buy caps and a hand crimper on Amazon. Ball jars work fine too. Just as long as you have a sealing lid so the carbonation doesn’t escape. We also like to add flavoring to the tea sometimes during bottling. A hands down favorite is ginger. Simply add a slice or two of ginger root to the bottle before you seal it. Let the bottles sit at room temperature for 1-2 weeks or longer for best carbination and flavor. Allow the tea mixture to sit in a dark corner of your kitchem for 5 days. On the 5th day, remove the mother and set it aside on a plate, pouring about a half cup of the fermented tea mixture over the mother to keep it moist. Put it in the fridge. Every other batch or so, you'll be able to separate the mother from it's "baby" which will have grown on top of it's old "mother." (It may separate on it's own, or you may just pull them apart.) When that happens, the "baby" will become the "mother" for your next batch of Kombucha Tea. The old "mother" can be passed on as a gift, or be disgarded. Periodically, you may notice your kombucha changing flavor in a way you don't like. When that happens, you can add a bottle of raw organic kombucha into your fermenting sweetened tea to restore the balance to the yeast and bacteria. Also, you kombucha "mother" may turn brown or bubbly or do any number of other strange things. None of these are problems. The only thing youw ant to really look out for is mold, and if it molds it will look like the mold on bread - fuzz and all. These instructions are assuming that room temperature where you're brewing you komucha is around 75 degrees. If the temperature is considerably warmer than this, it will take less time to ferment. If it is considerably cooler than this, it will take more time to ferment. ***Best Temperature is between 65-90F degrees.